We haven't spent much time together. You see, I've been busy and she is confused. Before, my world revolved around her. She would be the first thing I set my eyes on when I woke. Or rather, when she woke me up. And the last thing I checked on before I went to bed. Just to make sure she was still tucked under her blanket. But recently her world has been turned topsy turvy, she is in a midst of a hurricane. She doesn't quite understand why. Why I'm always in a hurry? Why we don't go to the park EVERY day? Why I don't feed her EVERY meal time? Why I don't drop her to nursery anymore? Why do we never mange to finish the story at bed time? Why don't we have play dates anymore? Why don't we spend hours playing in the bath nowadays? Why do I have to share my toys? 'Why' has been a prominent question in our home lately. Sometimes I have an answer, a lot of the times, I evade the question. Whilst Maryam is loving being the big sister and having a young brother to cuddle, play with and experiment on (! ), she hasn't been liking the fact that I cannot spend all my time with her. There just aren't that many hours in the day anymore. But I had a plan. A surprise to make it all better again, to make ir right, to make her happy. Like old times. And that's exactly what we did for Valentine's. I measured. She chopped, whisked and mixed. And tasted of course. That is always part of the plan. Together, we baked and for a little while, there was a pause in the WHY. That is how we spent our Valentine's. Simple. But with a decadent treat. 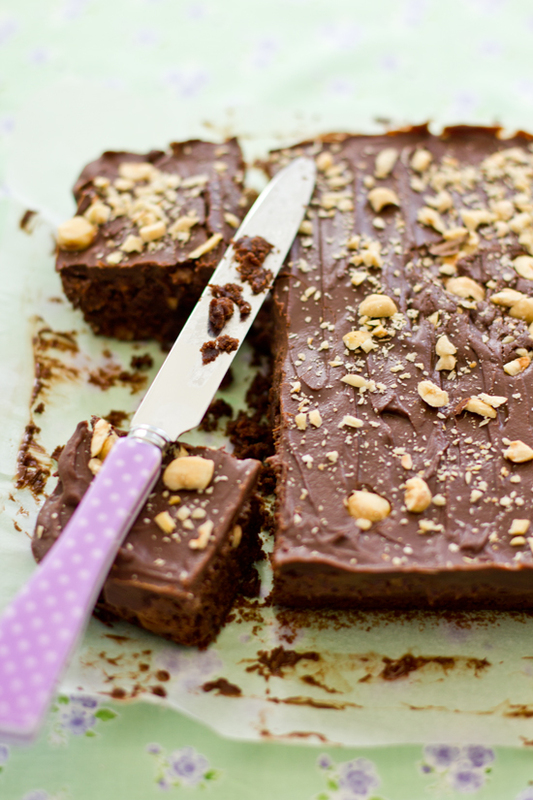 A chocolate brownie cake with hazel nuts and Nutella. It was gooey, fudgy and the perfect end to our dinner. Preheat the oven to 180 degrees Centigrade and line a rectangular pan with baking paper. 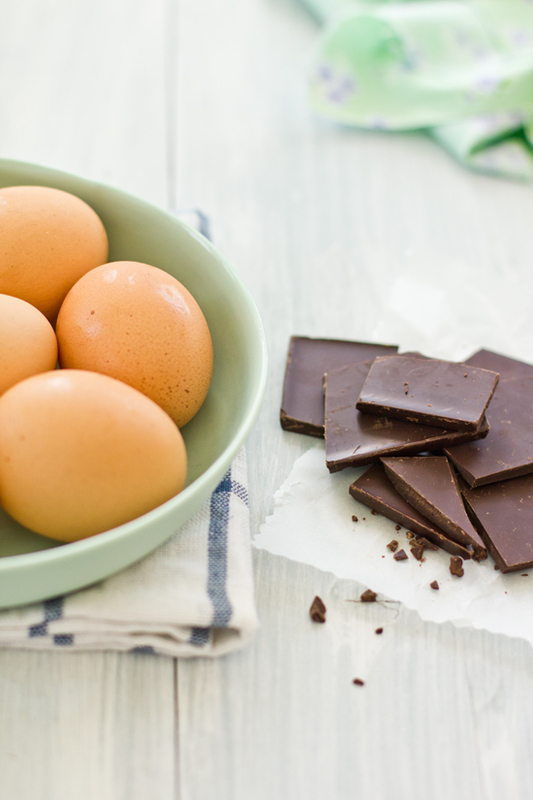 In a bowl set over a a pot of boiling water, melt the butter and chcolate until smooth (can use a microwave). In whisk together the eggs and sugar. 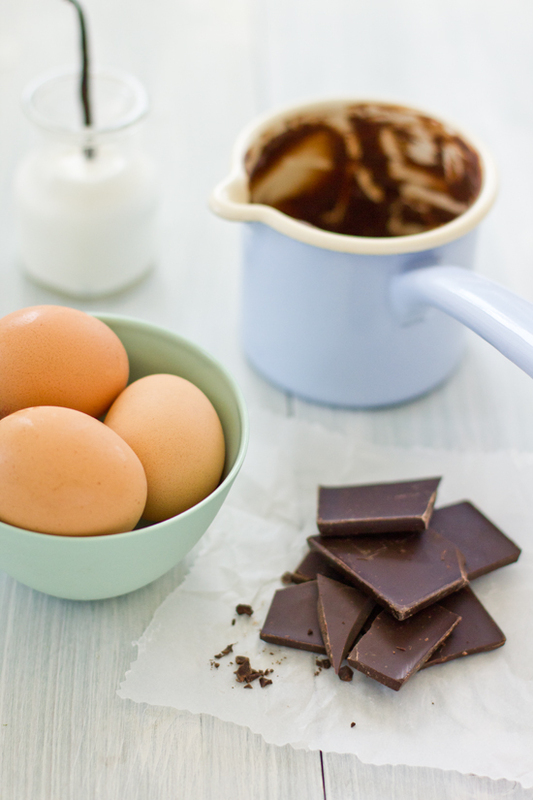 Add the chocolate mixture to the egg mixture. Add dry ingredients into the liquid mixture until just incorporated. Pour into prepared pan and bake for 20-23 minutes or until a toothpick comes out with only a few crumbs. Refrigerate brownie cake after it has cooled. In the mean time, mix all the ingredients of the Nutella layer. Spread over cooled brownie cake. Refrigerate for 30 minutes or so or until it has set. In the mean time, prepeare the ganache by melting all the ingredients in a bowl set over boiling water. 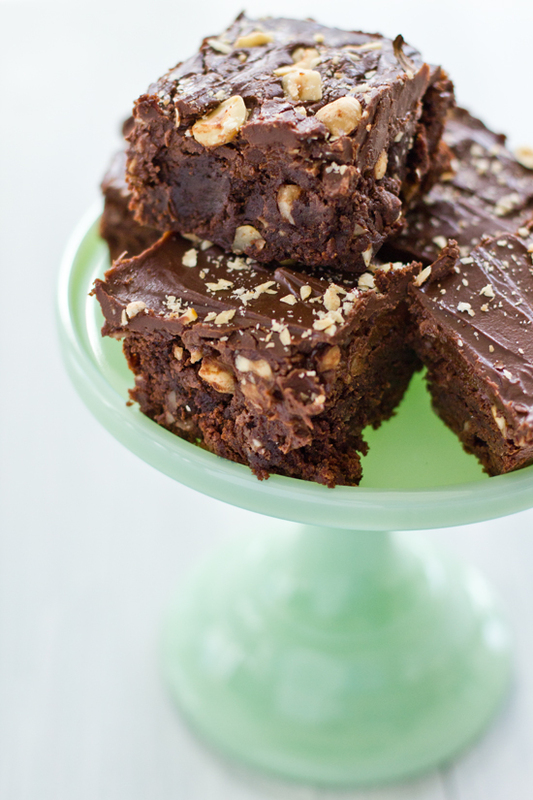 Pour ganache over the set Nutella layer and immediately garnish with chopped hazel nuts. Refrigerate for 20 minutes or so to set the ganache layer. So cute. Those brownies look amazing. WOW, these look positively divine. So decadent, I wish I had some right now! Love to try this one...great photos! Yum, your brownie cake looks absolutely mouthwatering!!!! Who doesn't love chocolate on valentines day. M looks like she's having so much fun Mummy. Simply adorable photos. Absolutely gorgeous looking cake!!! Such wonderful clicks!! LOOOOVE this :) .... that is all. Oooh - this is just layers and layers of gooey loveliness - and just when you think you've had enough - there's another layer of nuts!! Great. This was of course not a good choice. Too see such sinful looking brownies in the morning. And then have nutella and hazelnut in the same sentence. I'll spend my day imagining this! Oh how sweet, I'm sure she really enjoyed being the center of attention again for the day. Love this, so delightful from beginning to end! oooo I made brownies for valentine's day too! 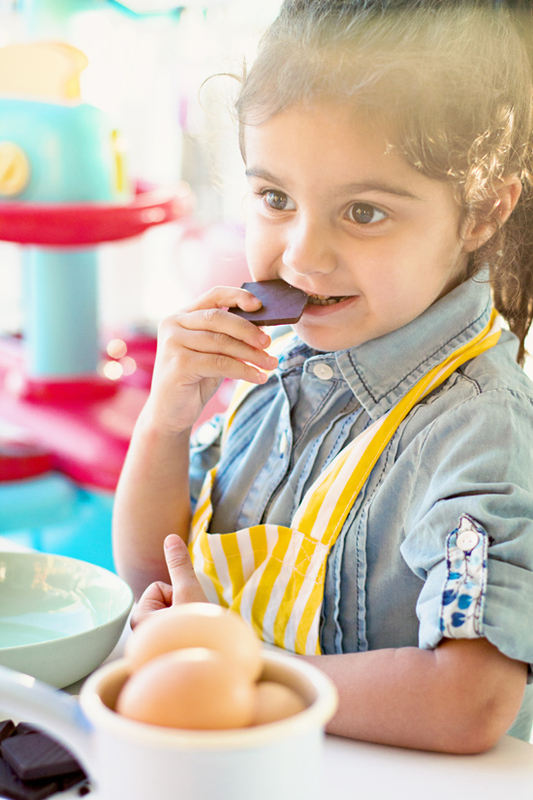 mine didn't include a gorgeous little daughter to mix and chop like you though, such a gorgeous way to spend some time together like 'old days' here's to more moments like these and more brownies! This was a very sweet post. I have two kids that are 13 months apart and I have to deal with this often. My daughter was young enough when my son was born that she doesn't remember that it used to be just her and I, but sometimes she still wants a little extra attention. I too, find myself in the kitchen with her making something when it feels like we need a little mother/daugher time. How sweet of a Valentine's day for her, especially when that cake was the end result! I love the cake. As My daughter is nutella obsessive I should make this for her. My daughter is not as small as yours ,she is a teenager. 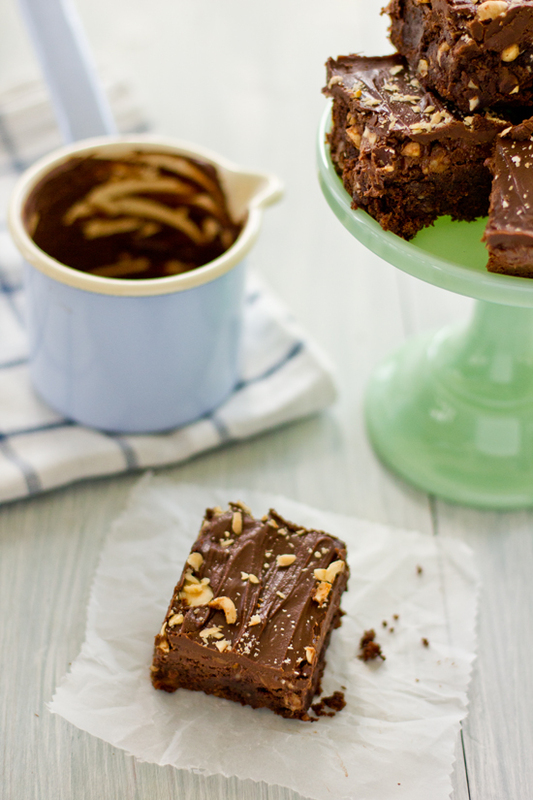 This Nutella brownie cake sounds irresistible! Yum! When i was little I used to always bake with my mom too, the best part was sneaking spoonfuls of dough to eat before we baked up cookies, some of my favorite memories :) Delicious looking cake! WOW, Nutella & Hazelnut are one of my favorite flavors! 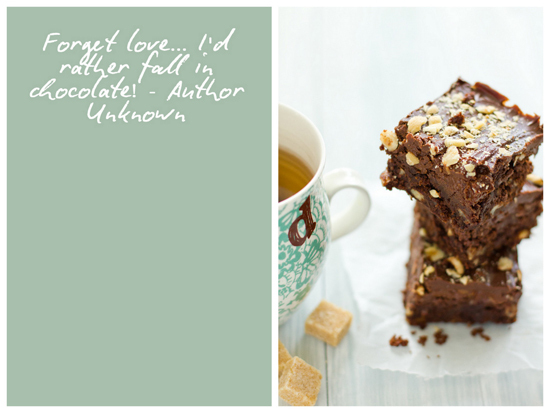 I can go for a piece of that scrumptious brownie right now! Your daughter is a doll, MA! The brownie looks DIVINE!! I'm going to the grocery this afternoon to make a batch!! Your daughter looks so adorable and quite chic with that denim shirt on. Beautiful photos... I am obsessing with that green cake pedestal! Where did you get it? 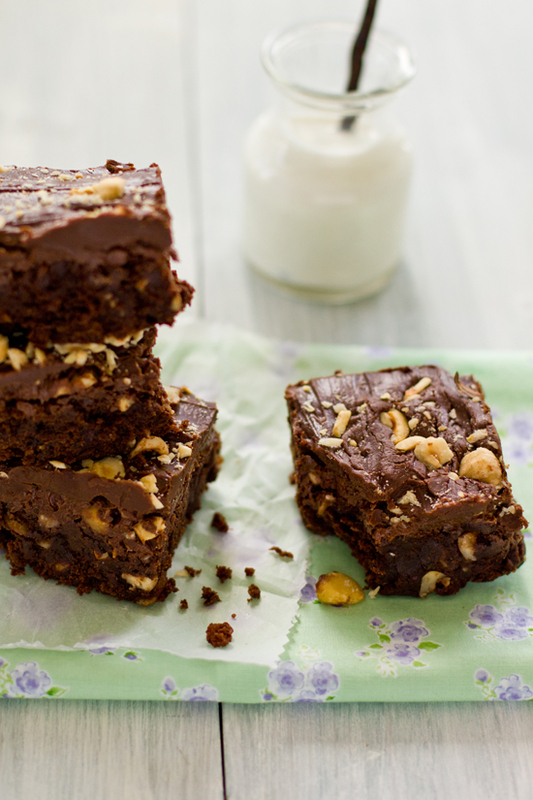 You can never go wrong with brownies. 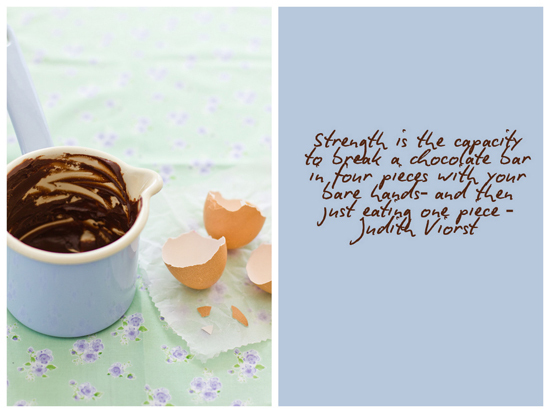 Chocolate is so uplifting, and add Nutella to that and you are set for perfect day of happiness. Thanks for sharing. One very decadent treat made by an equally scrumptious little princess:) She is beautiful Sukaina. It is a confusing time for her. But she will understand how special you are trying to make it for her. Hugs to you and the babies. Many wishes and hugs to your little angels. 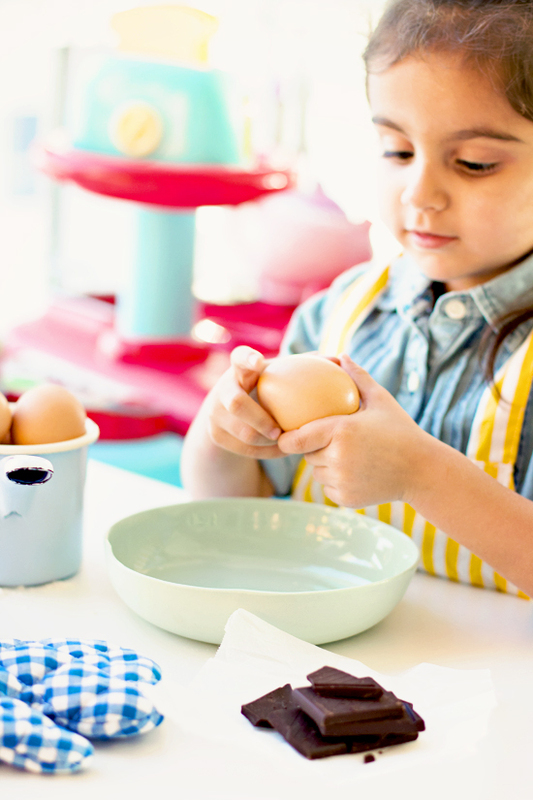 Your little helper is super cute. And that brownies?!? Are you kidding me?! DROOLICIOUS! 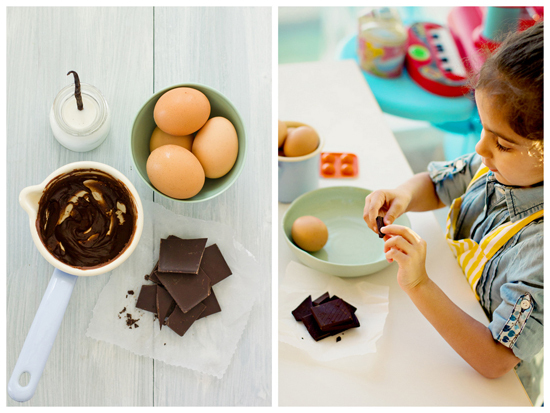 What better way to celebrate Valentine's day or any other day... and with such a cute sous chef :-) This recipe is absolutely delicious, something I must make, especially given my recent Nutella and hazelnut obsession and my life long addiction to chocolate. Yum! I'm adding it to my Pinboard as a reminder to make this soon. 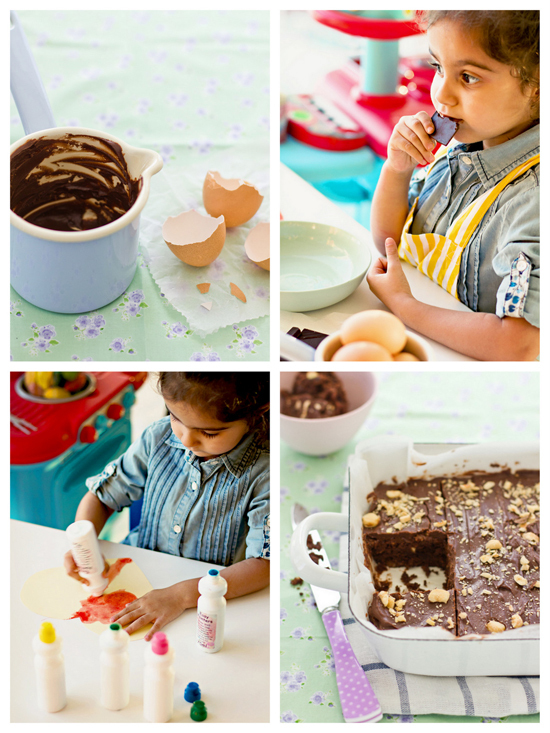 How sweet, she looks like she really enjoyed her special time :) These brownies do indeed look delightful! Kathy- the cake pedestal is from a UK company called Re Found Objects. Thanks for visiting everyone and have a fabulous weekend. She is sweet.. and the brownie looks goergious. Thank you for sharing Soukaina. These cookies could make a great dessert. Thank you for sharing this recipe. Beautiful photography and mouth watering recipe. 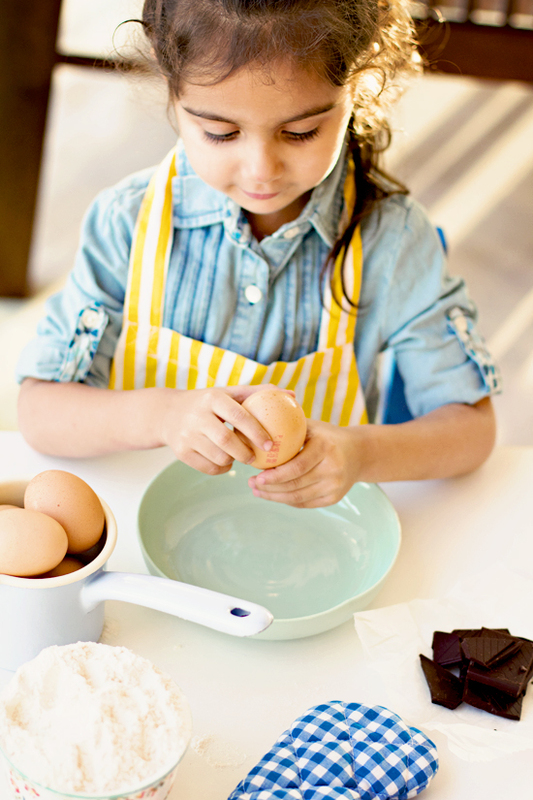 Look forward to bake those lovely brownies with my daughter. Every time I visit your blog I get an inspiration: your photography is beautiful and your stories are close to my heart:) I won't mention this cake as it contains my favorite ingredients and right now I can only bookmark it on Pinterest for some other time (after some pesky 10 lbs disappear, miraculously, of course). brownie is my fav food! will certainly try it out! I bought natella yesterday, and I would love to make brownie with it! i'm in love with your blog. I had read an article about you a while back in a magazine and jotted your blog's name on a pad to check out. i came across that pad as i was spring cleaning yesterday and realised that you've changed your blog's name to this one. I'm glad i found you and totally in love with your posts and photography. I will have to try some of the recipes and let you know how they turn out. I just made this and it is incredible!!!!! Thank you!